Va Theodore "Teddy" Roosevelt (27 Jerrey Fouyir, 1858 - 6 Jerrey Geuree, 1919) ny 26oo Eaghtyrane ny Steatyn Unnaneysit veih 1901 derrey 1909. V'eh nane jeh fir toshee er y Phartee Pobblaghtagh as ny Chiannoort er York Noa. V'eh ny screeudeyr shennaghys, najooree, ronseyder, helgeyr, ughtar as sidoor. Ta enney share er er son e phersoonid. 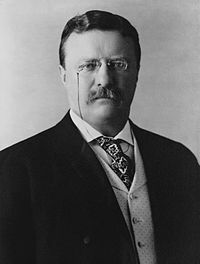 Ta tooilley coadanyn mychione Theodore Roosevelt ry-gheddyn ayns Wikimedia Commons. Hie yn duillag shoh er ny reaghey er 8 Mayrnt 2013, ec 18:09.